Today in America and across much of the world, there exist predatory lending institutions which are happy to give short-term loans at high interest rates to essentially anyone. The most common and obvious example is the payday loan. If you drive through “the wrong part of town,” you will see these on at least as many corners as there are convenience stores of cafes. They are everywhere and they are delighted to give short-term high-interest loans of a couple-hundred dollars to literally anyone regardless of the person’s credit or personal history. I read an article about how bad these places are for their customers and for civilization, and it made me think of The $100 Startup by Chris Guillebeau. What if it was possible to reliably beat predatory interest rates with smart investments? This idea could turn these predatory loans into widely available venture funding for small-scale projects like the ones Chris Guillebeau describes in his book. I call this idea, the micro-gig rather than Guillebeau’s term micro-business because this isn’t necessarily a business. The idea is to beat the predatory loan, not necessarily to build something sustainable that you want to keep doing in the long-term. I have always enjoyed projects more than businesses. It’s easy to pick projects up and set them down when you get bored. This makes the process a lot more interesting. The biggest challenge is the timeline. In California, a payday loan of $300 gets you $245 cash but you only have a couple weeks to pay it back. This means that a successful project needs to generate a 20% return in a very short time. Luckily, this is actually relatively easy. Those levels of returns are much harder with larger dollar amounts than they are with these smaller amounts. There are huge online communities dedicated to the art of flipping. This means buying something and then immediately selling it for a profit. Personally, I have had great success with flipping. It is super easy to find trendy things like Ikea furniture for very cheap and then sell it for more. Several times, I’ve been able to sell Ikea furniture for more than I paid for it new, even months or years later. This is especially true if you check out Ikea’s As-Is section where you can regularly find floor models and returns that are half-off. It’s super easy to flip these for their regular price or even more within a short time. Another easy type of product is consumer electronics. I have found expensive and perfectly functional consumer electronics at thrift stores for just a dollar or two, then flipped them for a hundred times that. An easy example is Apple products. It is critical to know you can get a return before buying something to flip. Local sales through sites like Craigslist are usually going to give you the best return, but don’t forget ebay. This makes appraisal easy because you can check ebay for sold listings. Here’s a true example from my flipping experience. I saw an Apple bluetooth keyboard with magic mouse at a thrift store for $5. I tested it on my phone to make sure it was working. Then I checked ebay’s sold listings for that device. They were going for close to a hundred dollars in “fair” condition. It was a no brainer! I bought it and flipped in the same weekend on Craigslist. About twenty minutes of work earned me $120. Another great tactic is using just in time inventory and specializing in a particular item. For example, I could work towards getting really good at selling “my amazon alexa that I never use.” Voice assistants regularly go for as much as half-off on ebay. So if I expect to sell it quickly, I might buy one to keep on hand. Once I start getting offers, I might buy a few more. As long as I can sell them at the same rate that I am buying them, my profits will continue to increase. If sales slow down, all I have to do is stop ordering them off ebay and wait to sell through my inventory. When I had my cafe in Chico, I had an idea. I borrowed a push cart and food warmer from a dorm and ordered a bunch of pizzas. I got 30 day terms, so I didn’t have to pay for the pizzas until a month later. I spent no money to do this. When the pizzas came, I wrapped each slice in aluminum foil and put them in the warmer on the cart. I had no trouble selling as much pizza as I could fit in the warmer, at 400% markup. I expanded to offer bottled water and energy drinks. People loved it, and it didn’t cost me anything. Thinking back to this, I am reminded of how many people I see selling “homemade” tamales out of their trunk outside the bars downtown. I can’t help but wonder if these are actually coming from those enormous bags of tamales that Costco sells for just a few dollars. How many other bulk food items could you sell out of a trunk for more than you paid for them? Hundreds of percent of markup is expected and normal with food products, especially when the customers are drunk people. Those ten dollar salads at Starbucks cost less than a dollar to make. In many cases, companies have online sales with crazy low prices. So flip it before you buy it. I have often listed things for sale on Craigslist which I haven’t even bought yet. If someone wants it, I will buy it and then sell it to them for a nice markup. There are great online communities dedicated to things like extreme couponing or general frugality which can help you find these amazing deals. Selling before you buy, or at the same time is called arbitrage. And it’s a huge part of price-equalization in every industry and market from foreign exchange to retail. Cash in! Get someone else to do the work for you once you sell the product. Why do you think infomercials need eight weeks to deliver their products? Because they don’t manufacture the products until after they’ve been paid for. This is called just in time manufacturing, and though it is technically illegal, it is standard practice in the industry. This idea is very much in the vein of The Four Hour Work Week. Author Tim Ferriss would argue you should test any business idea this way. There are so many examples you could do in your own town without needing to invest anything. Find a business where employees aren’t wearing branded shirts and sell the manager a batch. Then go order them from a local shop. They don’t want to pay up front? That’s fine. You know where to get a quick loan for a few hundred dollars. All of these micro-gig ideas I’ve discussed here are basically foolproof, with very minimal risk. There are lots of other ideas with slightly higher risk and more potential rewards. I would love to hear about related ideas that are working for people, or feedback about the ones I’ve mentioned here. Drop me a line at chris.j.trowbridge@gmail.com. I watched this video in order to cultivate some skepticism in myself, and it has proven impossible to shake the argument it makes. Best case scenario, if you work late nights and work a lot, you are still barely breaking even with the miles you are putting on your car. If you don’t have a new car with great mileage, there is just no way you are going to make any money. By the time you fulfill all the entitlements of Uber passengers with food, drinks, and gum, you are probably spending money to drive for them. It makes the most sense to people who need short-term cash-flow and are not worried about hurting their vehicle’s equity. But I think that those situations would be better remedied by improved personal finance habits rather than depreciating your car. That said, I really enjoy meeting all these new people and having interesting conversations with them. I do not anticipate doing any more ridesharing. Sacramento is a sprawling metropolis, like a spoked wheel with eight freeways reaching 40 miles out from the city core up to the mountains and out across the valley. This spoked wheel suggested a strategy; people are like a tide moving in towards the center, and later out from the center. I started my day around dinner-time halfway out one of these spokes in an affluent suburb called Roseville. I immediately got a couple heading downtown for dinner, and a $20 fare. I made it my strategy to head out one of the denser, more affluent spokes until I got another call heading back downtown. This worked well until the tide started heading back out from downtown. Then I switched my strategy, heading back downtown after taking each rider out to their homes. I took home $225.86 and two bags of pretzel rolls on my first night in less than eight hours of work. This was almost triple what I made at my day job on the same day. If you decide to start driving for Lyft and Uber, please help me out and use these links or my referral codes. The first gig apps I want to try out are the obvious ones; Lyft and Uber. I recently bought a three-year old Honda Civic. I did it partially with this in mind. This was the best equilibrium-point I could find between low long-term operating cost and low depreciation based on age while staying within budget. The Prius was significantly better in both categories, but at about triple the total price. Despite my buying this car because I know it will be reliable, I also added the dealer’s comprehensive end-to-end coverage of any mechanical problems which was an extra $3/mo. Next I went shopping for insurance. This was tricky. I had Progressive before, but they do not offer ridesharing coverage. I ended up switching to AAA. They offer competitive ridesharing coverage with the added bonus of having all their perks like roadside assistance, partner discounts, etc. This usb charger supports quick charge as well as non-quick charge. This means I can use QC on my Nexus while letting iPhone users charge up the old-fashioned way. This charger cable is the best one I could find to support a lot of different kinds of phones while still being able to reach the back seat. Also the price is right. This is a basic aux cable that lets the riders play their music. It reaches the back seat and its only a few dollars. I wasn’t able to find seat protectors online that I liked, so I went to O’Reilly and found a set there that fit. Now I was ready for the road! I was 14 when I had my first gig. I was suddenly DJ-CJ and making well over $100/hour… every once in a while. There are any number of apps which will pay you to do work for them whenever you feel like it. This offers enormous flexibility and freedom alongside job-security and the ever elusive power to decide when to work. what’s stopping you? Your work. For these and many other reasons, I decided to try these gig apps and chronicle my experience. 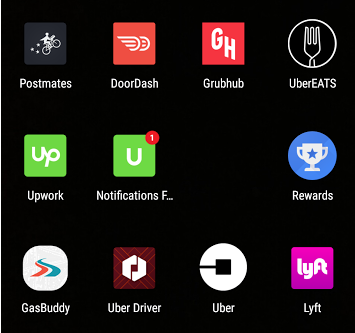 Lyft and Uber are the obvious choices, but I also picked GrubHub, DoorDash, PostMates, UberEATS, Upwork, and a few others.